OK – now for the wine. Do I have a treat for you this week! As Pinot Gris/Grigio was the wine variety voted on by many of you for this months grape variety – some of the comments I received asked for new wines of your favourite grape. Well – you can thank me later! In the glass, Bollini’s Pinot Grigio is watery pale lemon colour and has a medium aroma intensity with notes of green apple, lemon, stone fruit (white peach) and a bit of minerality. On the palate, this Pinot Grigio is more complex than many Italian Pinot Grigios’ I have tasted. It is dry with medium plus acidity and medium alcohol. The body was medium minus with medium flavour intensity. Sounds kind of like a ‘medium’ wine, right? Well – trust me – it isn’t! In the mouth, the gorgeous combination of lemons and green apple and peach really blend well together and are rounded out by an under layer of limestone minerality. As I have said before – there seems to be a huge backlash against Pinot Grigio lately. This Italian lovely defies that. 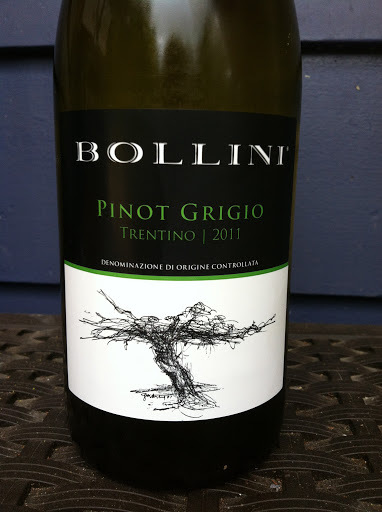 Bollini’s Pinot Grigio is not a complex wine, but personally, I am not ALWAYS in the mood for a complex wine. Sometimes, I want a fantastic bottle to open up, enjoy with friends and simply enjoy it. Bollini’s Pinot Grigio is a fantastic example of what a good Italian Pinot Grigio can taste like – there is more ‘going on’ in this wine than most Pinot Grigio’s I have tasted and it is my new favourite PG from Italy! It gets a solid “Hell Yes” from this girl! Try this Bollini 2011 if you want a new PG on your list of favourites. At $18.99 – this wine is a bargain and a wonderful hostess gift for a spring or summer party! Pair with a light green spring salad or a chicken dish with lemon juice. That is it for today – my lovely readers.